When will be Britain's Best Walks with Julia Bradbury next episode air date? Is Britain's Best Walks with Julia Bradbury renewed or cancelled? Where to countdown Britain's Best Walks with Julia Bradbury air dates? Is Britain's Best Walks with Julia Bradbury worth watching? Julia Bradbury chooses some of her favourite and most accessible family treks from across the UK. Julia's walk offers one of the most outstanding views over Loch Lomond – at 24 miles long, it's the largest loch in Scotland by surface area. Picking up the West Highland Way, she hugs the bonnie banks through to the little village of Balmaha on the eastern side of the Loch, and takes a quick boat trip to the ancient Lomond isle of Inchcailloch, with magnificent views across the water and out to the surrounding fells. She finishes with a well-deserved Loch Lomond ice cream on her return. North-West England's most popular mid-distance walk, the Sandstone Trail offers a vast array of attractions en route - from celebrity wedding favourite: Peckforton Castle; to the medieval fortification of Beeston Castle. Julia takes in the rolling countryside pastures and panoramic views over the Cheshire plains and Liverpool. It's a popular route for dog-walking and sports – from the local Tough-Team race, to one of the top board and bike tracks in the country, not to mention the intrepid 4x4 off road experience at Peckforton – Julia packs it all in. A hidden treasure on the Exmoor coast, Julia's walk sets off from the picturesque harbour-town of Lynmouth and meanders under the tree-green canopy of water-rapids following the East Lyn River and the Hoar Oak River, merging together at the stunning Watersmeet National Trust café – the perfect spot for a hard-earned cream-tea. She then reveals a magical walk down the Laxey Valley to explore its mining heritage and climb the world's tallest water wheel. Equidistant between England, Ireland, Scotland and Wales, on a clear day the Isle of Man affords views to all five kingdoms and Julia leads us to the top of Snaefell Mountain to share its spectacular summit. From ancient Neolithic sites, Viking strong-holds to electric mountain railways and the pull of peregrines, puffins and dozens of nature trails – there's plenty packed in this walk on an Island only ten miles wide and forty miles long. Britain's Best Walks with Julia Bradbury next episode air date provides TVMaze for you. 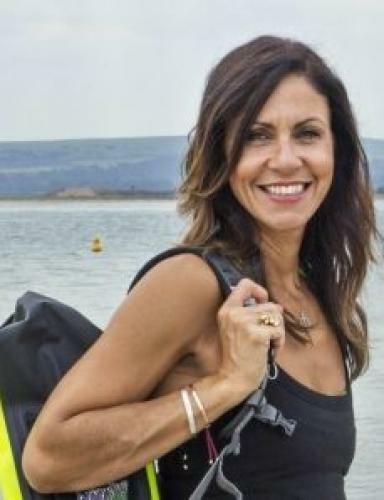 EpisoDate.com is your TV show guide to Countdown Britain's Best Walks with Julia Bradbury Episode Air Dates and to stay in touch with Britain's Best Walks with Julia Bradbury next episode Air Date and your others favorite TV Shows. Add the shows you like to a "Watchlist" and let the site take it from there.